How do you select a restaurant in New York City, not too far from the theater district, that satisfies 12 to 14 women with varying tastes and interests? Answer: it’s not always easy. When it’s time for my annual NYC trip with friends, I research, ponder, research some more, and then hope for the best. When this year’s dinner at Upland garners unanimous raves, I feel like I’ve been handed a culinary award. 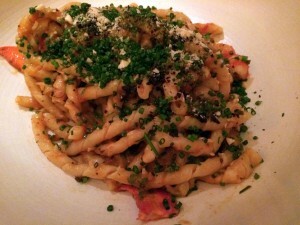 Upland is American food with an Italian accent, in a beautiful setting on Park Avenue South. It actually feels more LA than NYC. Light wood tables, leather chairs, shelves lined with lemon-filled jars, copper accents, and high ceilings provide the perfect ambiance for the creative, seasonal cuisine. Upland has the Stephen Starr name behind it, so it has built-in credibility. He’s the restaurateur behind DC’s Le Diplomate and too many restaurants in New York, Philadelphia, New Jersey, and Florida to mention. 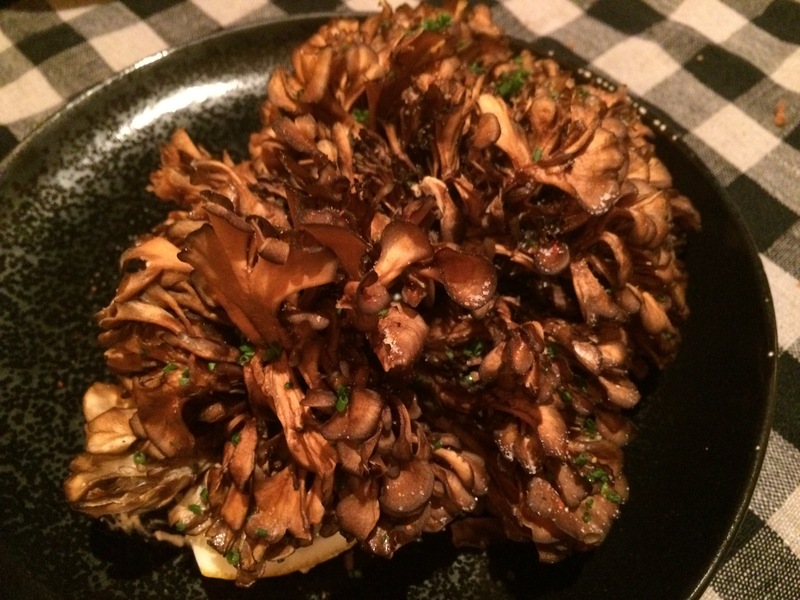 The California feel at Upland is courtesy of Chef Justin Smillie, a California native. 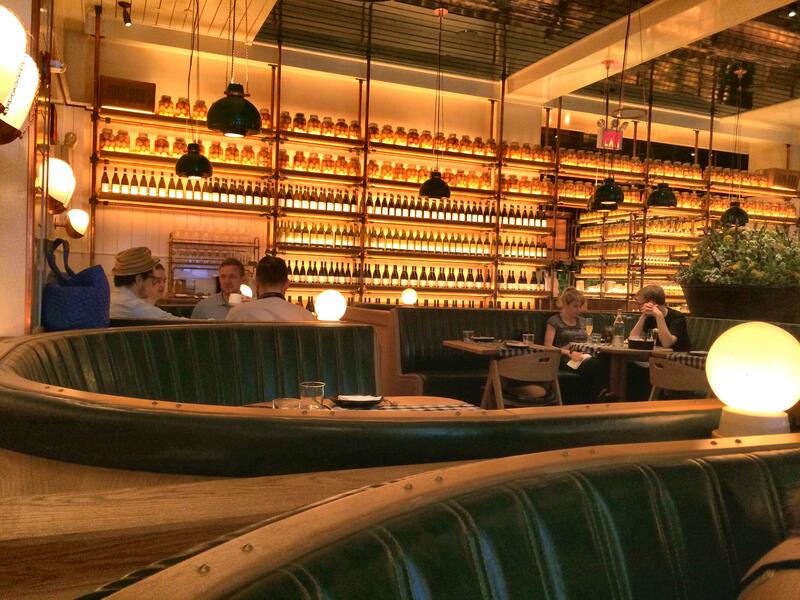 Upland can be universally appreciated based on a menu that is both approachable and innovative. One can order pizza and a salad and be perfectly happy, or go a little more on the wild side with slow cooked lamb neck. The menu progresses from pizza and vegetables, and then three sections with salads, pastas, fish and meat. My group of twelve is divided into three separate tables. My group never makes it to fish and meat, so intrigued are we by the other sections of the menu. Whole crispy maitake mushroom elicits wows right off the bat with its unique appearance and texture. We devour the dish, along with the zippy sauce of cloumage cheese and herbs. Torpedo beets are elevated by hints of citrus and delicate robiola cheese. 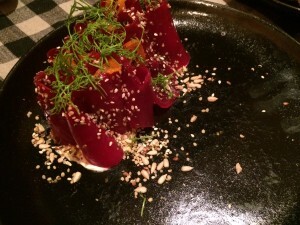 The beets are dusted with seeds, which add an appealing crunch. 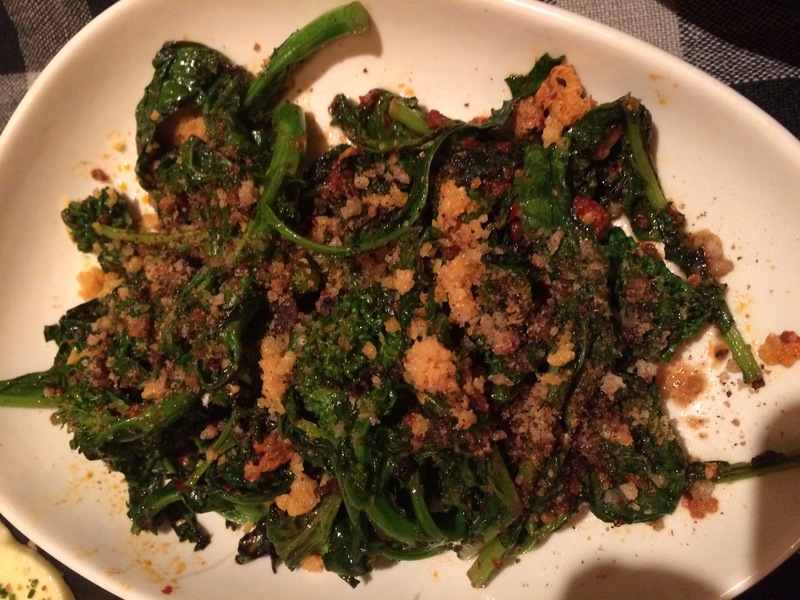 Broccoli rabe with spicy pork sausage and a healthy dose of breadcrumbs brings the heat. After our first few dishes we conclude that vegetables at Upland command great respect. 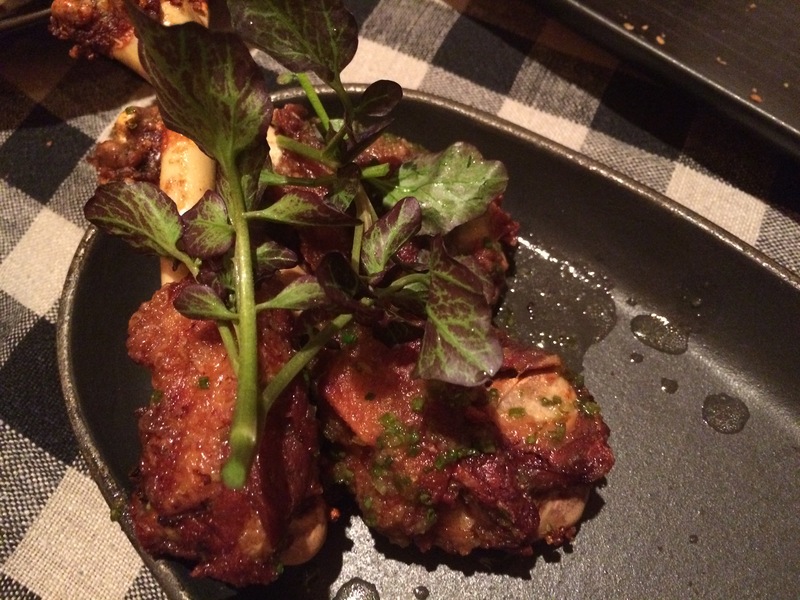 We move on to crispy duck wings. They dominate my list of favorites here, with powerfully sweet and spicy flavors that compliment the meaty wings. 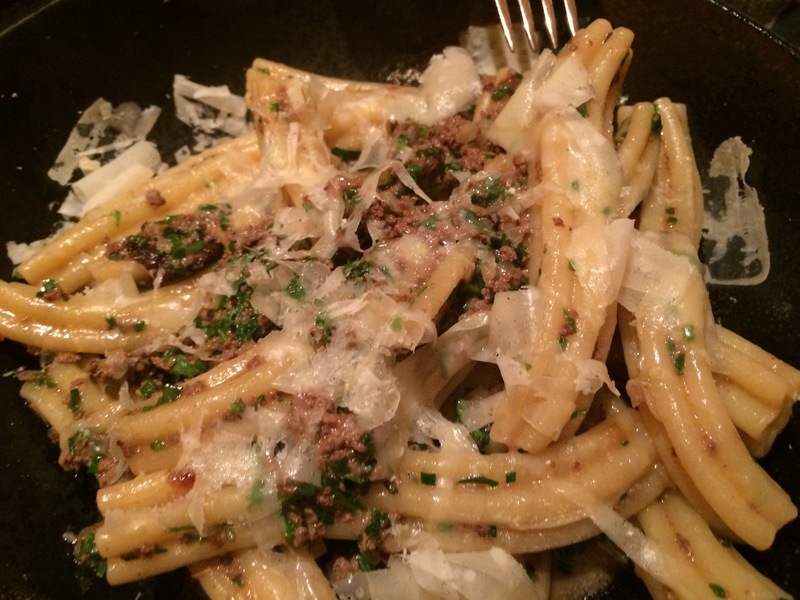 Pastas are equally impressive. Estrella with chopped liver and a mixture of herbs isn’t my grandmother’s chopped liver, but it is a compelling dish. I like it more than I anticipate. I prefer pasta with Maine lobster, olives, chives, and marcona almonds, which showcases the chef’s talent for deftly applying spices. But then so does every dish that precedes it. This is actually my second visit to Upland. 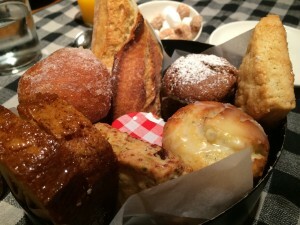 My first is for brunch just a few weeks earlier, when I am captivated by a bread basket featuring grapefruit pound cake, a baguette, scones, and superb bombolini. Both of my visits to Upland are distinguished by exemplary service. My group has different servers for each of our tables, and we each boast that ours is the best. Shout-out to Rafael, who is the perfect navigator for my table. 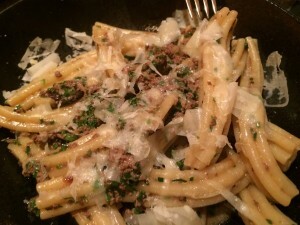 One of my friends proclaims her meal at Upland the best restaurant meal she’s ever had. Many promise a return visit, and two friends make reservations before leaving the restaurant. I admit that I can be sensitive when I select a restaurant and it’s a fail for any of my companions. So when it’s an overwhelming success, I am uplifted. Thank you Upland!